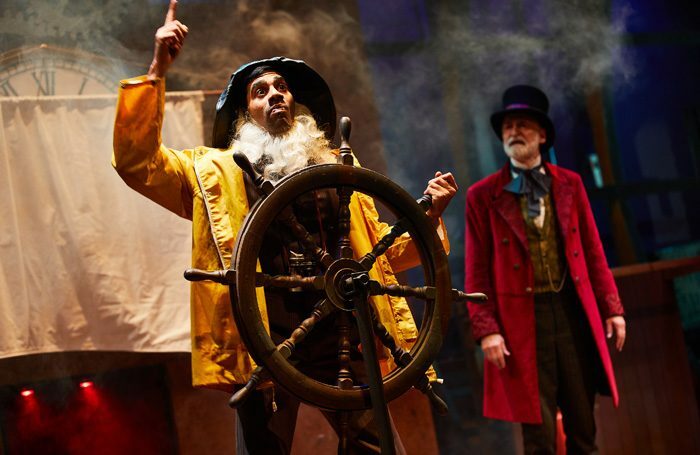 Leeds Playhouse follows Amy Leach’s intense, sprawling production of Hamlet with Toby Hulse’s irreverent, pacy and unashamedly silly adaptation of Jules Verne’s 1873 novel, Around the World in 80 Days. From the moment near the start when Verne himself (Dan Parr, having the time of his life) leaps onto stage to “offer advice” to the characters he’s created, it’s obvious that this is going to be a very metatheatrical take on the exploits of Phileas Fogg and Passepartout. Hulse has stripped down the story, so that it uses just four actors and runs to just under two hours. Director Alexander Ferris keeps the action and comedy moving at a brisk pace and there are some set pieces to treasure. Joe Alessi gives a brilliantly comic turn in which he switches between Passepartout and a member of the British Consulate, and Darren Kuppan is impressively energetic as the hapless Inspector Fix. Amanda Stoodley’s set is also used to creative effect, with various props being used to mark how far along Fogg is in his global journey. The humour is a bit too broad in places and overly reliant on gurning and silly walks, but as it’s aimed squarely at families, this can be forgiven. At other times, Jennifer Jackson’s movement direction produces something unexpectedly beautiful, like Alessi and Kuppan’s dance on San Francisco harbour. Arriving just in time for the school holidays, this is that rare thing – something that kids will find fun, while being knowing and clever enough for parents to enjoy.